City officials suggest it would provide a way to pay for improvements along the Highway 8 couplet. For practical purposes, it's worth remembering what Cornelius looked like at the start of this decade. Sidewalks were missing along stretches of the Highway 8 couplet, which splits between Adair and Baseline streets for about half the length of the city, and on 10th Avenue, a major north-south route. Streetlights were sparse. Street trees were sparser. The business community was in the doldrums. There was barely any reason for motorists passing through to slow down, much less stop. These days, things are different. Many of the streetscapes are improved, and new construction has brought a two-story building and a three-story building to Adair Street — the first hint, perhaps, of the downtown feel that city officials and business leaders want to cultivate. A master plan is in the works to lay out steps to building on the progress that has been made, creating a thriving, walkable and family-friendly downtown core. But while change has come quickly to Cornelius by many standards, in some ways, it seems slight. Just a couple of blocks down from a gleaming new mixed-use library and apartment building, the old Grande Foods supermarket — formerly Hank's Thriftway — still sits empty. On the south side of Baseline Street, which carries eastbound highway traffic, there is still a stretch of gravel lots interrupted by a derelict gas station and the vacant Western States Fire Apparatus building. In between Adair and Baseline streets, some blocks are dominated by well-trafficked chain businesses like Starbucks and Sonic, while others are home to mom-and-pop storefronts that range from the natty to the ratty. Last Tuesday, Jan. 22, Cornelius city councilors and planning commissioners met to discuss an option that some city officials think could further accelerate the redevelopment process: urban renewal. While some cities need a vote of the people to form an urban renewal agency, all that is required in Cornelius is the City Council's approval. That's something the council is seriously considering, according to Mayor Jef Dalin. "You don't do urban renewal unless you have blighted areas, and wouldn't you agree that we have some blighted areas of downtown Cornelius?" Dalin asked rhetorically. Of the rest of the five-member council, he added, "I think they're definitely open to it, and I think we've seen what a difference it makes being able to encourage development or redevelopment." As community development director Ryan Wells explained it, urban renewal would essentially translate the town center master plan, which is currently under development, into reality. "What I think is a not-very-common opportunity that we have with this project … is we're also going to have an urban renewal plan that will directly help to fund a lot of those ideas and concepts and projects in the town center," Wells said. He added, "Oftentimes, somebody gets a town center plan, but then they have to go out for grants, or they have to save up through their capital or enterprise funds for infrastructure projects. … With an urban renewal plan, what we expect to do is those same projects that are identified in the town center plan, those are going to be on the project list for the urban renewal plan. So within a pretty well-known and expected amount of time, we can implement those projects." Urban renewal districts are funded by what is known as "tax-increment financing." Instead of raising taxes to fund projects, like a bond measure would, this mechanism freezes in place the amount that each taxing agency receives in property taxes from the urban renewal area for a set number of years. For that duration, any amount of property taxes — the "increment" — collected above the "frozen base" level is directed to the urban renewal agency. Property taxes naturally tend to rise over time due to a combination of factors, including monetary inflation and increasing property values. Since the goal of urban renewal is to improve the social and economic vitality of the area, the process tends to drive up property values over time — in turn, increasing the amount of funding that the urban renewal agency receives to pay for improvements. The urban renewal area that Wells is proposing to the council has considerable overlap with the "town center" area that the draft master plan defines. The urban renewal area would run along Highway 8 from one end of Cornelius to the other, stretching north to take in some neighborhoods, as well as a couple of shopping centers toward the east end of town and the industrial district in the northwest. 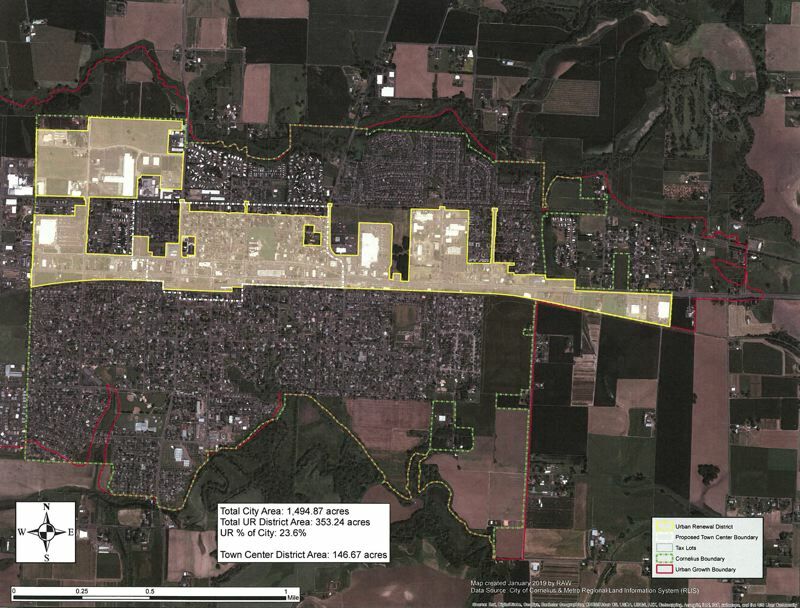 "There's a lot of increment opportunity here," Wells said, tapping the industrial area on a map with his forefinger. "The actual amount of urban renewal funding that will go into this area might be limited, but the increment — the contribution to the urban renewal district with the development increment — is going to be substantial from here, so that's why we needed to capture that." The proposal is still in its early stages. Dalin said city officials have yet to decide whether a 10-, 20- or 30-year urban renewal plan is best suited for Cornelius, and all of the types of projects for which it would pay haven't been determined at this point, either. An open house to further explain how urban renewal would work in Cornelius has been scheduled for March 7. Wells said he is aiming to have a council decision before October. Editor's note: A previous version of this story misstated the height of two buildings in downtown Cornelius. The Virginia Garcia Memorial Health Center is two stories; Cornelius Place is three stories. The story has been corrected.